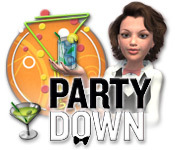 Inspired by the Starz channel TV series, take over the Party Down catering team as you help the Hollywood elite celebrate in style! It`s up to you to keep the music playing, the food coming, and the conversations going as you schmooze with the stars. Keep your cool, show them what you got, and maybe you can become the next big thing! Save your sister and uncover the secrets of an ancient organization in Silent Nights: The Pianist!